The top English league goal scorer of all time is to be considered for a place in a football Hall of Fame. 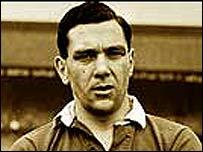 Although Arthur Rowley never won an international cap he became a legendary player at Shrewsbury Town in the 1950s. His record tally of 434 goals in 619 League matches was achieved with four different clubs over 19 years. The National Football Museum said it would add his name to a list of 2008 candidates which will be whittled down and then voted on by a panel. David Pearson from the museum told BBC News that judges - a mix of former players and managers - did not always just look at players in the higher leagues. He said: "Arthur Rowley would be a great candidate... and we've had a number of e-mails about him, but I'm delighted to say he's on the long list for next year. "But it's the likes of Sir Bobby Charlton and Sir Alex Ferguson to decide, although it's not always the players who have played consistently at the top level that are considered. "The panel like to look at those who have served in a number of divisions and teams and need to be recognised in that way." Rowley also played for West Bromwich Albion, Fulham and Leicester City. He joined Shrewsbury Town in 1958 and over the next decade scored 152 goals as player-manager, a club record that has never been matched. He died at the age of 76 in December 2002. The museum's Hall of Fame for players - male and female - and managers started in 2002 and previous inductees include Jack Charlton, Tony Adams and Bill Shankly.